IT IS VITAL TO PROTECT YOUR INVESTMENTS! Asphalt is an investment. Asphalt driveways and parking lots are no exception to the rising costs that plaque our industries. Oil prices continue to escalate, forcing the cost of oil based products, such as asphalt, to become a skyrocketing expense. Invariably, those expenses are absorbed by the consumer. FORTUNATELY, THERE IS A WAY TO PROTECT YOUR ASPHALT! Avoid the costly burden of major asphalt repair or replacement by letting our professionally trained crews maintain the durability and appearance of your existing asphalt. Properly maintained asphalt enhances the curb appeal of your property and extends the longevity of your asphalt. 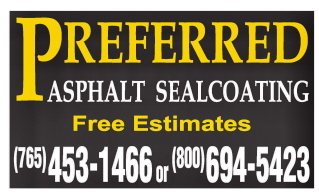 PREFERRED ASPHALT SEALCOATING is backed by 16 years of experience. 1. Customers are No. 1. 2. No hidden cost. We do what we say we're going to do, within an agreed time frame. 3. Customer satisfaction is guaranteed.